India's junior education minister, Satyapal Singh, raised a few eyebrows on Wednesday when he said that engineering students needed to be taught about ancient Indian scientific discoveries, including the fact that the plane was first mentioned in the ancient Hindu epic Ramayana. 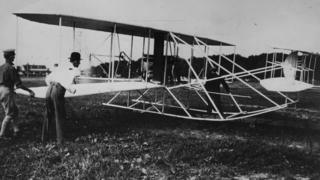 Mr Singh, who was the chief guest at an engineering awards ceremony in the capital Delhi, also told the gathering that the first working plane was invented by an Indian named Shivakar Babuji Talpade eight years before the Wright brothers. Shivakar Babuji Talpade's alleged achievements remain unverified and Mr Singh's comments have been ridiculed on social media. However, he is not the first Indian minister to make such claims, either about ancient India's contribution to science or that it invented the plane. A speaker at a prestigious science conference in 2015 told his audience that the inventor was really a sage named Bharadwaja, who lived about 7,000 years ago. Captain Anand Bodas, a retired pilot and head of a pilot training facility, also claimed that India had interplanetary aircraft thousands of years ago, along with sophisticated radar that was superior to today's systems. Here are a few other dubious scientific claims that have attracted attention in the past. In 2014, Prime Minister Narendra Modi told a gathering of doctors and medical staff at a Mumbai hospital that the story of the Hindu god Ganesha showed cosmetic surgery existed in ancient India. "We worship Lord Ganesha. There must have been some plastic surgeon at that time who got an elephant's head on the body of a human being and began the practice of plastic surgery," he said. According to Hindu mythology, Lord Ganesha was created when Lord Shiva attached the head of a baby elephant to the body of a child. Image caption Did Lord Ram build a bridge across the sea to Sri Lanka? Last month, the chief minister of the western state of Gujarat, Vijay Rupani, made a speech at the Institute of Infrastructure Technology Research and Management where he praised the "engineering skills" of Lord Ram, one of Hinduism's most popular deities and the protagonist of the epic Ramayana. The Ramayana says that Lord Ram built a bridge from India to Sri Lanka in order to rescue his wife Seeta, after she was kidnapped by the country's demon king. The Palk Strait, the narrow stretch of ocean that separates India and Sri Lanka, shows signs of what may well have been a land link made of shoals between the two countries. Many Hindus believe that it is, in fact, a remnant of the bridge built by Lord Ram. "Imagine what kind of engineers Lord Ram had to build the Ram Setu that links Sri Lanka and India… Even squirrels offered their help in building the bridge… Even today people say that remnants of Ram Setu are in the sea," Mr Rupani was quoted as saying by Indian media. The education minister for the western state of Rajasthan said in January that it was important to "understand the scientific significance" of the cow, as it was the only animal in the world to both inhale and exhale oxygen. Vasudev Devnani did not present any studies that disprove current science which has established that cows do in fact exhale carbon dioxide. He was widely ridiculed after his comments were reported in the media.